Another brilliant art works from the Chinese ink painter – Wei Gan, a lady who started to learn Chinese ink painting from a very young age, completed her MA degree in painting at the Governors State University, USA. Her father is a professor of Chinese ink painting, Wei was encouraged to enjoy and learn to express herself by just using a brush, black ink and rice paper in an early age. 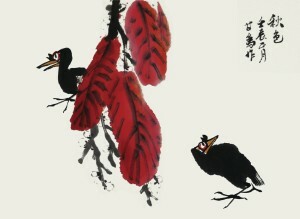 In Chinese ink painting there is no pre-sketching on the rice paper and no erasing on the ink stroke once it is made. Even though is hard and challenging for the little girl; it never stopped Wei’s enthusiasm on ink painting. Wei Gan will present some of her favourite topic, – ‘Birds’ in this exhibition , because they bring so much joy when you watch them, and they are the symbol of freedom for the Chinese. The exhibition is open from 3rd November – 18th Nov, 10 am to 4 pm, Monday-Saturday. 12 – 4 Sunday. Admission Free.